Fire TV Stick and other Fire TV devices have enough processing power to stream video, and some of them can even stream in 4K, but problems like slow speeds, lag, and app crashes still happen. If you're experiencing any of these problems, then you should clear the cache on your Fire TV Stick or Fire TV. In most cases, clearing the cache on your Fire TV Stick will fix problems like slow speeds and app crashes. However, you may need to clear app data, clear cookies, or even reset your device to its factory settings if that doesn't do the trick. What Is a Fire TV Cache? One of the most useful things about Fire TV devices is that you can download apps that let you watch videos, listen to music, and do a whole lot of other things. Each app that you download has a cache, which is data that the app temporarily stores on your Fire TV device while it's operating. When an app stops working correctly, one of the most common causes is a corrupted cache. In some cases, an app can also slow down and not perform as well as you expect due to a cache that has become too large. In both of these cases, the solution is to clear the cache. There is no option to completely clear every cache stored on your Fire TV device. The only way to clear the cache on a Fire TV Stick or other Fire TV device is to clear the cache for each individual app, or to clear the cache of only the specific app that's giving you trouble. Press the Home button to return to the Amazon Fire TV home menu. Select an app to clear its cache. If your app still doesn't work correctly, repeat this process and select Clear data. Some apps, like Firefox, also allow you to Clear cookies. To clear additional caches, press the back button on your remote, select a different app, and then select Clear cache for each additional app. Clearing the cache of an app that tends to create an especially large cache can help free up space on your Fire TV Stick, but that's only one option. If your aim in clearing the cache on your Fire TV Stick is to free up space, then you also need to look at the size of individual apps and how much data they store on your device. Press Home on your remote, and navigate to Settings > My Fire TV > About > Storage. This screen allows you to see how much storage space is left on your device. If your device really is running low on storage, then you will need to clear the cache or data on some apps, or even remove apps that you don't use regularly. You need to select Device or System instead of My Fire TV with some Fire TV devices and older software versions. Press Home on your remote, and navigate to Settings > Applications > Manage Applications. Press up and down on your remote to scroll through your installed apps, and look at the information on the right side of the screen. This will allow you to identify which apps are taking up the most space. Size: The total amount of space taken up by the app, local data, and temporary cache. Application: The amount of space the application takes up by itself. Data: The amount of space taken up by locally stored data, like photos and videos that have been permanently downloaded to your Fire TV device. Cache: The amount of space taken up by temporary cache files. To free up space, select an app you don't use a lot, or one that has a large cache or locally stored data. Uninstall the app, clear the cache, or clear local data. Use Clear cache to remove temporary cache files, Clear data to remove locally stored data, or Uninstall to remove the app along with its local data and cache. Repeat this process until you have enough free space. Clearing the cache of an app on your Fire TV Stick will typically allow the app to start working correctly again. In some cases, you may need to choose the clear data option, or even delete the app and re-download it. 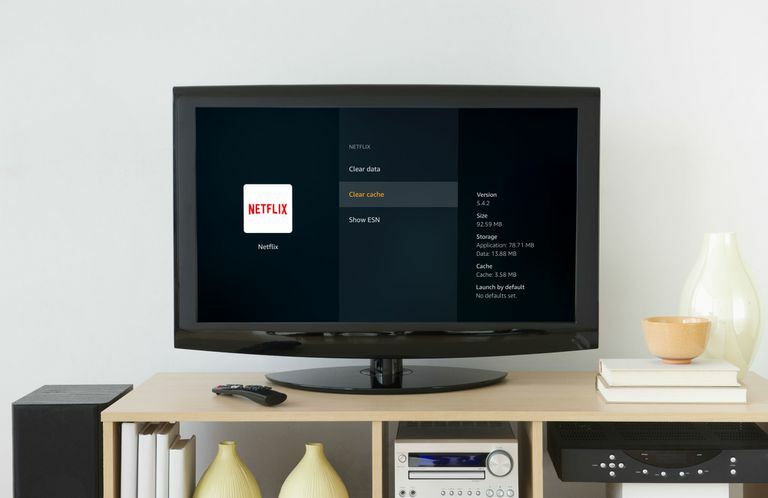 If your Fire TV Stick or Fire TV device still doesn't work correctly after clearing the cache of individual apps, you can perform a factory reset to clear all of the data that's stored on your device. This effects your entire Fire TV Stick instead of only dealing with one app at a time. Do not perform the following factory reset process if your only goal is to clear the cache on a few apps. The following process will return your device to its original factory state, which will delete all of your apps. Navigate to Settings > My Fire TV. Depending on your device, and the version of your software, you may see Device or System instead of My Fire TV. Wait for your Fire TV device to reset.